The Kothringi (or Lustrous Folk) are a silver-skinned tribal people indigenous to Black Marsh. 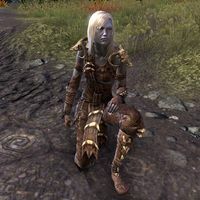 Once considered the only humans native to Tamriel, they are now known to have shared the continent with many other tribal groups. They were rumored to be avid sailors, sailing as far as Hammerfell, notably spreading the Knahaten Flu of 2E 560 to Valenwood and nearby provinces by ship. Most Kothringi were wiped out by the Knahaten Flu only a few decades previous. However, several surviving members can be found in Shadowfen, in the settlements of Stillrise Village and Zuuk. This page was last modified on 27 June 2014, at 23:19.